Get LED Boat Lights and Forget About Battery Drain! Wonderful stuff, electricity; without it, life aboard a sailboat would be a lot less pleasurable. But get the balance of electrical demand and supply out of kilter and that enjoyment will be considerably curtailed. LED boat lights will go a long way towards reducing the demand side of the energy equation, and the consequent depletion of your domestic battery bank. Until recently, most cruising sailors had little choice but to use either incandescent, halogen or fluorescent light bulbs in their boats. LEDs (Light Emitting Diodes) have brought marine lighting into the environmentally conscious 21st century, using some 90% less power and producing much less heat (particularly halogen) than conventional power-hungry lighting. And whereas you might expect around 1,000 hours out of an incandescent bulb, and 8,000 hours if you're really lucky out of a fluorescent tube light, an LED can last for 50,000 hours. Well, that's just about forever, isn't it? If there's a single reason for not having LEDs, then I'm not aware of it. First let's remind ourselves of what the regulations say about visibility and range. 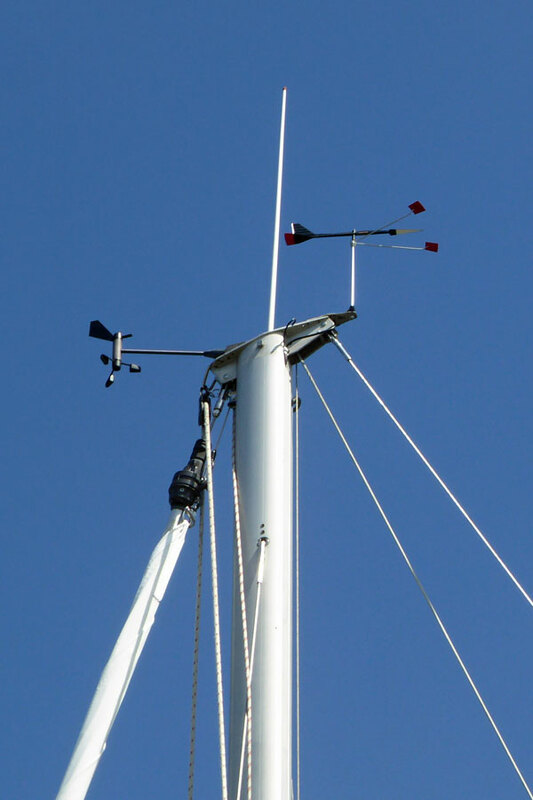 To save battery power, most of us opt for a combined tri-colour (port/starboard/stern) light at the top of the mast, and most of us have had to climb the mast more than once to change one of the infernal bulbs. Now I don't know about you, but I view a trip up the mast with increasing disdain these days, and would pay good money to avoid it if I could. Another compelling reason - if you need one - is that a conventional tri-colour is likely to demand 10w from your battery, whilst the equivalent LED tri-colour will be happy with around 1.5w. At anchor, our boats are required to display an all-round white anchor light "where it can best be seen". On a sailboat, anywhere other than at the top of the mast it's bound to be obscured from some directions - usually by the mast or the bimini. So I think it makes a lot of sense to combine your tri-colour with an anchor light as shown here. However, having said all that about tricolour navigation lights and anchor lights at the top of the mast, perhaps we ought to think a little more 'outside of the box'. There is an argument that due to the miserly current draw of LED boat lights, you could go for separate port, starboard and stern lights and not bother with a tri-colour at all. Furthermore you could combine the port and starboard lights into a single Bi-Colour unit, and save half the wattage of individual port and starboard lights. If you could then find another suitable location for the anchor light other than at the top of the mast, then trips to the mast-top would become a thing of the past altogether. If you choose to go for individual bow and stern lights, you'll need one of these - mounted either at the top of the mast, or somewhere lower down where it can best be seen. On the stern gantry maybe? It used to be that LED lights gave off a harsh, white light; but not any more. Modern LED boat lights provide much the same warm white light that you'd associated with incandescent lighting. Having made the decision to go down the LED route, then one approach would be to remove all your existing light fittings and replace them with new LED versions - like the ones shown here for example. If your current light fittings are past their best, then you may well decide that this is the way to go - but if they're still OK, you may be able to find an LED conversion kit to suit the fittings you already have installed.